If you are not sure how to play 75 ball bingo you certainly are not alone! There are so many different types of bingo that it's a good idea to know the game before spending any of your hard earned cash that's for sure. How do you play 75 ball bingo? 75 ball is a very popular online bingo game, second only to 90 ball bingo and was most commonly found in the US. This game of bingo is often shunned in favour of 90 ball bingo game by players from the United Kingdom, because it offers only one prize, instead of the minimum three prizes commonly found in 90 ball bingo. 75 ball bingo does contain less numbers however, thereby making it a much faster game for players preferring the thrill of a speedier paced game. The biggest difference between 75 ball bingo and 90 ball bingo is the grid, or the bingo card as it is more commonly known. 75 ball bingo features a 5 X 5 card, with every single grid on the card containing a number. Each column of the grid also corresponds to a letter, with B, I, N, G, O commonly spelt out across the top, with a letter in each column. Generally speaking, the first column (B) will contain numbers 1 to 15, the second column (I) will contain numbers 16 to 30, and so on and so forth, until the final column (O) contains numbers 61 through to number 75. 75 ball bingo is unique in that not all of the numbers need to marked off in order to win though. In 75 ball bingo, the game can also be about the pattern. Players will certainly need to know exactly what type of bingo game they are playing before they begin. 75 ball bingo can be known as coverall bingo too! In 75 ball coverall bingo, also known as full card or blackout bingo, the objective of the player is to mark off every single number on the card. Moreover, they must do so before the 41st number is called from the pot on most occasions. Of course, there are exceptions to this rule however, depending on the game you are playing. 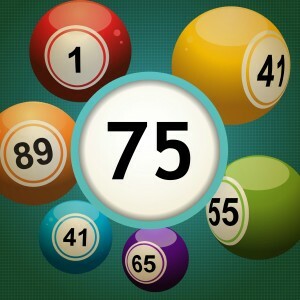 Regular 75 ball bingo requires the player to simply finish a line. This can be done either horizontally, vertically, or diagonally. It is uncommon to find any other game of bingo that permits diagonal lines outside of 75 ball bingo. You also have the four corners pattern game. In four corners 75 ball bingo, the player must simple match the numbers in the four corners of his or her ticket. For example, using the lettering, this would be B1, B5, O1 and O5. 75 ball bingo also comes in a number of alternative bingo patterns. Such patterns as coffee cups, umbrellas, and many more “shapes” and “objects”, like a Christmas tree, or diamond pattern are very common in bingo games too. These bingo patterns generally come with special prizes also. Another alternative is that for big money games, players must call bingo on a specific number in order to win a superior prize; this prize is often worth way more than the typical 75 ball bingo jackpot. On the very rare occasion, a player might come across what is known as a Dual Tab or Double Action card. This is a bingo card that may have 2 numbers to 1 square. In this form of bingo, your chances of landing that particular square are obviously doubled, although it is not common and will certainly not be found in any British 75 ball bingo game. This option is almost exclusively found in the United States but we like to cover all bases! 75 ball bingo is enjoyable if you want a speedily finished bingo game, without the need to congratulate (and therefore pause the bingo game currently in session) of the one line and two line winners, for as mentioned, in seventy five ball bingo, there are none. In 75 ball bingo, it really is the jackpot or nothing.